The episode starts with Sherloque translating and Nora spying on him. She goes to Thawne, who has a plan, like he always does. Barry has set up Iris’s office, but she isn’t paying attention. She is reading a review of her new newspaper as boring and safe. She wants to write about Cicada. Barry, Ralph, and Caitlin have the cure in S.T.A.R. Labs. It works by neutralizing dark matter in the pituitary gland. It isn’t instant. It can take up to a minute to work. What they need is a neuro stasis field generator, which could calm Cicada down long enough for the cure to work. The only problem is that they have all been stolen. Ralph has people for that, specifically Earl Cox. There is a black market run by Goldface. CCPD has been trying to catch him for a long time, but nobody knows where the market is, and it disappears too quickly for anyone to catch him. Barry is skeptical, but Ralph convinces him to try. Nora brings Sherloque to Jitters and manufactures a meet cute. Sherloque manages to screw it up and Nora offers to help. Barry and Ralph say the magic words and literally fall into the black market. They are immediately put into explosive meta cuffs but are left alone once they explain who sent them. Ralph tries to keep Barry out of trouble but leaves him alone where Barry inevitably gets himself into trouble. There is a guy selling guns that can rip through police body armor. Barry tries to buy all of them and brings attention onto himself. Iris interviews Dwyer’s manager, who does not want to talk. She eventually gets an address out of him and decides to go check it out. Ralph found a guy willing to sell them the generator, but Goldface is suspicious of Barry because he doesn’t antihero part of his personality. He does do a fabulous villain impression though. It’s so good in fact, that Goldface wants their help stealing an artificial organ printer that’s going to a hospital. Iris finds Cicada’s cousin’s house. The only problem is that Cicada is home. Nora asked Sherloque’s ex-wives for help. Four of them responded. Sherloque is ticked because now they know where he is. It turns out that they are all the same woman from different Earths: Renee Adler, because of course. They all want their money and they’ve hired Breacher to get it. Ralph and Barry talk. Barry is blaming himself for getting them into this situation but is willing to go through with it. Iris gets caught, but it looks like she was coming in the front door. She pretends she doesn’t know who he is and begins to interview him about lead leaking into the water pipes. Nora talks to Sherloque. She tells him that he can’t deduce his way to a happy ending. That isn’t how love works. Ralph locks Barry in the van so that he doesn’t have to go through with it. It turns out that he can’t go through with it either. When he finds the printer, he knocks out the criminal with him and tries to get out. It doesn’t work and he’s taken out to be “disposed of” along with Barry. The only problem is that Barry isn’t in the truck. They both fight off the bad guys and go back in with guns on stun. This all has a soundtrack to go with it, like they’re in an action movie. They do eventually win, but then their cuffs start blinking. Goldface is waiting for them. He turns off the exploding feature on the cuffs and they stun him. He gets up and powers up like a Bond villain. He uses his necklace like a weapon and starts to choke Ralph. Barry taunts him into electrocuting himself, but he’s still alive. 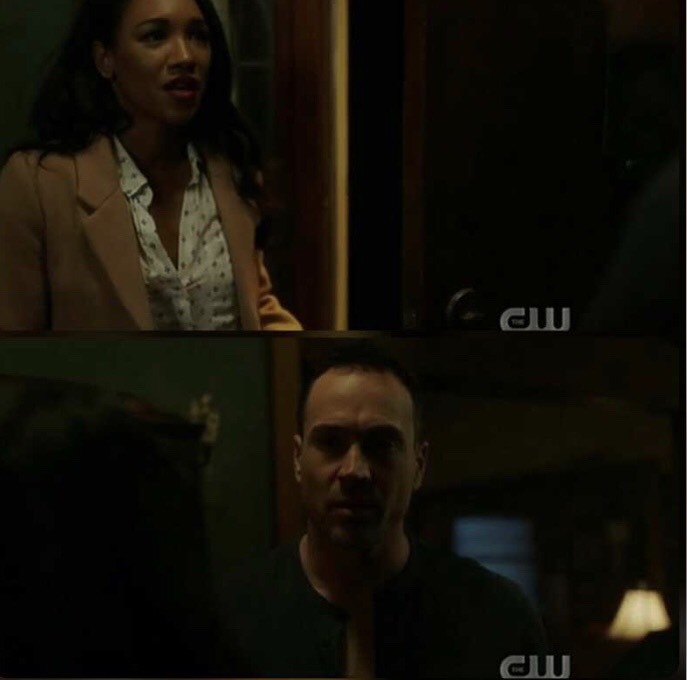 After the interview is over, Iris tries to nonchalantly grab her bag and go, but Cicada notices that she didn’t have a bag when he caught her and blocks her exit. She uses old fashioned pepper spray and a kitchen knife in his meta wound to escape. When Team Flash gets there later, he’s nowhere to be found. The good news is that Iris knows how to give him the cure. Sherloque tries again with Adler and it works. He also discovers that she’s a meta, or so he thinks. Nora might have engineered that so he would do more research on Cicada and less on her, which is exactly what happens. Barry needs to keep that suit. 8/10.